SenoraChase January 18, 2018 June 12, 2018 Games, Let's play! This is one of my favorite CI games. It is so easy to load them up with tons of language they’re reading and hearing, and they don’t even know it because they’re focused on winning. I made this game up when I was trying to think of ways to give my kiddos lots of examples of the past tense, but really you could target any grammar structures your heart desires. Once you’ve read all the statements, students trade and grade (which really is code for MORE INPUT! MORE REPETITIONS!) 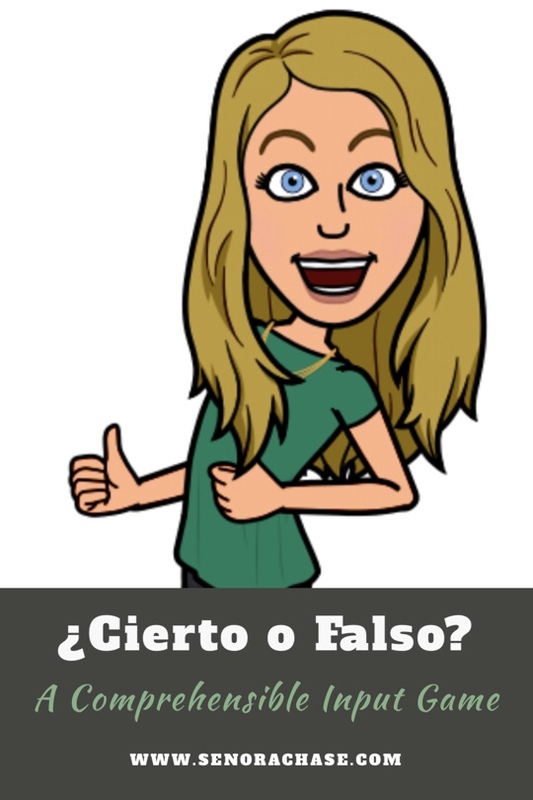 Teacher projects the statements again, and goes through everything again, really hamming it up (in Spanish or French or Latin or…) It sounds like this (but in Spanish!). #1. Mrs. Chase kissed a famous person. Class? True or false? Who thinks that Mrs. Chase kissed a famous person? (Students raise hands) Who thinks that Mrs. Chase did not kiss a famous person? (Other students raise hands. Pause dramatically to build suspense). FALSE! Mrs. Chase did NOT kiss a famous person. Please! Mrs. Chase only kisses Mr. Chase. And repeat for every. single. statement. Such great repetitions and the kids have no idea! They’re just listening so they can correct the paper in front of them! Once we finish “correcting” students get their own paper back and I do my whole routine (in Spanish, obvio) Stand up if you have 10 points or more…..stand up if you have 13 points or more….stand up if you have 22 points or more. Students sit down once they’re eliminated and the last few students standing are named the winners and receive a stamp on their stamp sheet. Elise is allergic to dogs. Danny broke is arm 4 different times. Jason’s cousin is on TV. Try it! It’s such a great game to target the grammar or vocabulary you want to get a lot of repetitions on. Maybe at a small school it would be fun to include statements about other teachers that they students all know. Or you could even do a little research about celebrities and students could guess True or False. Just imagine: Justin Beiber has 6 toes on his right foot. I’m off to research some celebrity trivia…. If you’re looking for other CI games to try in your language classes, may I suggest The Lucky Reading Game or Pop Up? I just did this today with reviewing winter vacation and it was fabulous! Great and simple idea, lots of input. Thanks for sharing. OMG – I LOVE THIS IDEA! I’m going to do this with my 4th & 7th graders!